so how do you know if an exercise is too advanced for you? Generally speaking, I consider an exercise to be advanced if it requires you to have good to above average ab strength, good to above average balance and coordination, and good to above average flexibility. And, lastly, I consider an exercise advanced if it places high levels of stress on the joints of the lower back. Simply put the advanced exercises, require good strength, good balance, good flexibility, and a stable lower back. The catch 22 is that the advanced exercises also promote good strength, good balance, good flexibility, and a stable lower back. So my recommendation is to start with the basics if you have not been exercising regularly, and after 4-6 weeks of consistent exercise try more challenging exercises. If you feel pain or discomfort (that's not simply muscle burn or fatigue) stop doing the exercise that causes the pain and seek advice from a licensed health or medical professional. 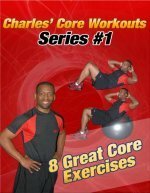 Alright... now that that's out of the way we can look at some more advanced stability ball abdominal exercises below, and after check out these related pages also. This is a popular stability ball abdominal exercise. It's usually one of the first that I teach my clients once they have mastered crunches on the ball and regular push ups. This exercise requires good to above average upper body strength. If you can do 10 or more push ups, you should be able to hold your body in position during this exercise. Starting Position: From a push up position, place your feet on the ball. Keep your arms straight and your abs pulled in. Form: Keeping your abs engaged, bring your knees towards your chest. Hold for 1 second, and then slowly return to the starting position. Personal Trainer Tips: Getting into the starting position can be the toughest part of this exercise. If you cannot hold yourself in the push up position and place your feet on the ball, start by lying with your stomach on the ball and walk your hands forward until your legs are on the ball. The further you roll out the more challenging the exercise becomes. The most challenging position is with the toes on the ball. You must have good upper body strength to perform this exercise. If you can perform a few push-ups, you should be able to hold yourself in the start position. Also, you must keep your abs pulled in as you extend your legs so that your back does not arch. This exercise is a natural progression from the stability ball roll-ins. The difference is that you keep your legs straight during this exercise. Form: Keeping your abs engaged and your legs straight, move your hips towards the ceiling. Hold for 1 second, and then slowly return to the starting position. This exercise directly works the obliques and the lower back. Of the stability ball abdominal exercises, most people feel the most direct work in the love handle area when they perform this exercise. Starting Position: You may need to anchor yourself during this exercise by placing your feet against the base of a wall or firm object. Lie with you left side on the ball. Stagger your feet so that your right leg is in front of your left leg. Place your hands behind your head. Form: Crunch your body to the right side, lifting your left side off the ball. Move in a straight line. Hold at the top for 1 second as slowly lower to the starting position. Repeat on the other side. Personal Trainer Tips: Getting balanced can be a little tricky in the beginning, but as you practice you will be able to complete this exercise without wavering. Just like other exercises that focus on one side at a time, you will likely notice that your range of motion and strength is better on one side. If there is a big difference or you feel pain on one side. Seek advice from a health professional. The stability ball can be a fun and challenging way to work your abdominal muscles. You can work your abs through a greater range of motion and improve your balance and coordination by using an exercise ball during your ab workouts. Or check out these advanced isometric exercises on the ball.